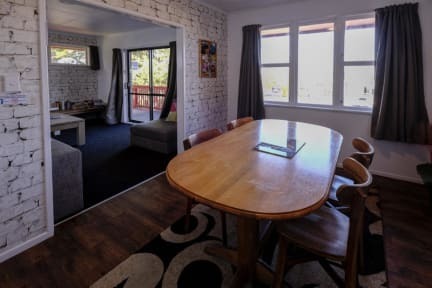 Haka Lodge Taupō is an up-market backpacker's hostel in central Taupō. Our ethos places the guest experience at the heart of everything we do. Come and stay in backpacker luxury with free unlimited WiFi, hot tub and stunning views of Lake Taupō! Haka Lodges are a modern New Zealand hostel network with fresh ideas, smart design and an eco outlook. 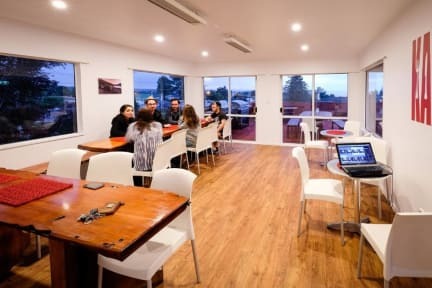 At Haka Lodge Taupō we offer a variety of up-market dormitory rooms for those travelling on a budget, and a wide range of private rooms for those who like their own space on the road. We welcome international travellers from all over the world, which means you never know who you might get chatting to in our large comfortable lounge, sunny outdoor patio, and newly renovated modern kitchen! The hostel has been set up by world travellers with all your backpacker needs in mind. We have a fully equipped kitchen, fluffy pillows, plenty of powr sockets, and that’s not even mentioning our volleyball court, BBQ, and super central location! We also know that your trip is about experiencing the beauty of New Zealand – that’s why our sun-loungers have uninterrupted views across Lake Taupō to Mt Ruapehu and Mt Tongariro – a perfect place to relax after an adrenaline-filled day in Taupō.